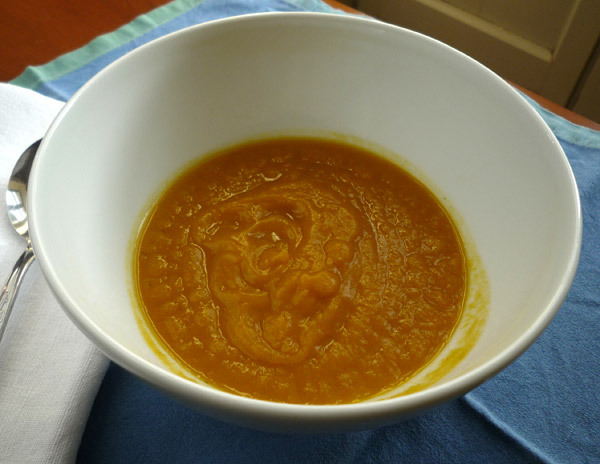 As promised, here’s a wonderful recipe for a thick and tasty soup using a small pumpkin known as the Potimarron. 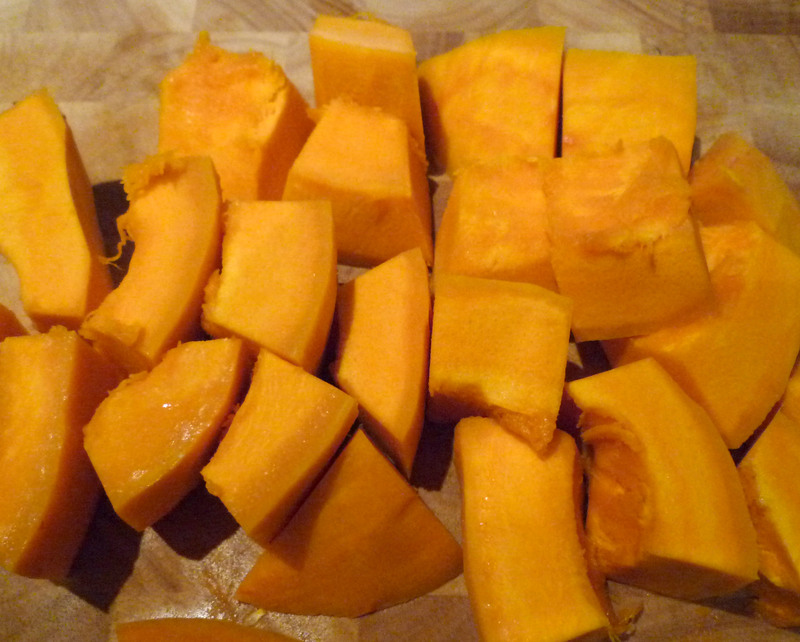 The flesh is dense and flavoursome and is perfect for adding to curries, risotto, vegetable crumbles and stews because it doesn’t break up as easily as larger pumpkins and retains it’s buttery, nutty taste. When made into soup, it hardly needs any other ingredients but in this French recipe, it’s paired with leeks to give a lovely earthy and Autumnal thick soup. Start by preparing the potimarron. If you have a steamer, place the pumpkin in the steam for about 5 minutes to soften the skin- it makes it much easier to peel. Meanwhile, wash and chop the leeks and an onion. Heat a large saucepan, melt the butter, then gently frythe leeks and onion until they are softened but not browned. 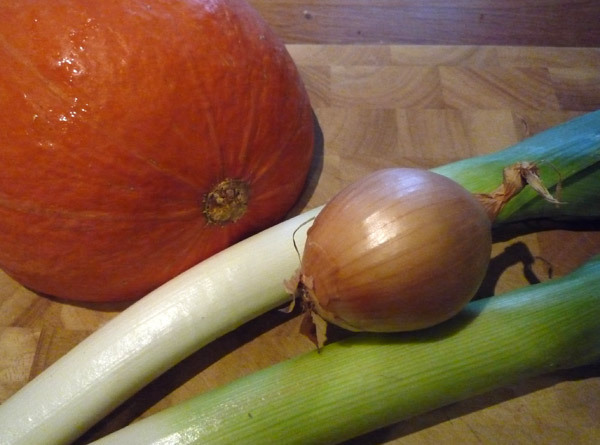 Peel then chop the potimarron into large chunks and add them to the leeks. Stir in enough stock to cover the vegetables, bring to the boil, cover and simmer for about 20 minutes or until the potimarron pieces are tender. Leave to cool a little then blitz in a blender for a smooth velouté. If it’s too thick, add a little water, season with salt and pepper to taste and reheat when you’re ready to serve. 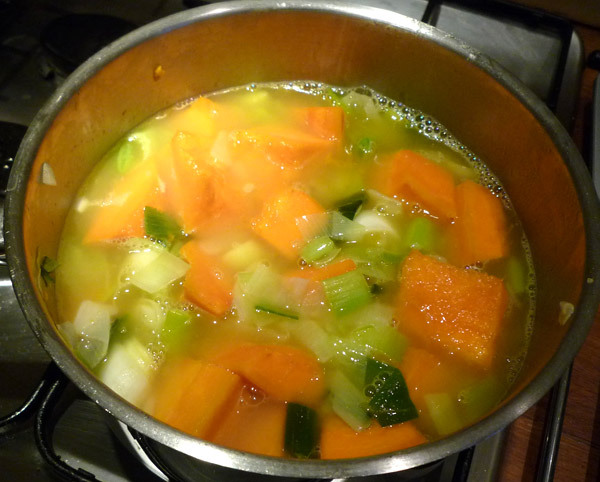 This soup tastes much better if it’s left for a day or more for the flavours to develop. Serve with a dollop of creme fraiche swirled through the soup for an extra creamy taste. At this time of year it’s pure pleasure to cook and taste vegetables that are freshly picked from the garden. One of my favourite dishes is a light risotto – perfect for an al fresco lunch or as a starter for a dinner party though you’d have to adjust servings accordingly. You can use a variety of summer vegetables such as fresh peas, French beans, courgettes or Swiss chard, either on their own or combined with red pepper or mushrooms. This year I have some particularly early squashes, normally useful as an Autumnal ingredient but which would work well combined with some chard as a nice contrast in colour. Follow the cooking method precisely for good results and I promise you’ll be hooked into creating risotto recipes of your own. Melt the butter in a pan, I use a deep frying pan but you can use a large saucepan instead. Add the chopped onion and red pepper if you use it and fry gently for a few minutes until softened. I add the mushrooms or chopped courgettes now and fry them for another minute or so before adding the rice. Stir the rice into the onion until it’s coated with butter then pour in the wine. It should sizzle, then stir until most of the wine has been absorbed. Now add a little of the stock and stir until absorbed. Repeat this until the rice is cooked, which should take around 17 minutes. If necessary, add a little more water if you run out of stock. If you’re using French beans, they will need a good 10 minutes cooking time to become tender. Fresh peas will only need a few minutes. After about 1o minutes I add the chopped stalks from the chard – they will take a little longer to cook than the leaves which you can add after about 13/14 minutes cooking time. Taste the risotto to test if it is ready. Aim for soft grains of rice and a risotto which is nice and moist. When the rice is cooked, add the Parmesan cheese and stir it into the risotto. Remove from the heat and serve immediately.